Using chemicals to strip off dead cells from the surface of the skin is a highly effective, if somewhat risky, way to accelerate the healing of active acne and old scars. There are products you can only get at a doctor’s office or a spa, and there are products you can use at home. Not everybody, however, should treat every kind of acne with a chemical peel. Chemical peels work by stripping off the dead skin cells, allowing for newer cells to take their place. At-home acne chemical peels loosen the “glue” that holds dead skins on the surface of the skin. Removing dead skin cells allows newer, more naturally colored skin cells to move to the surface, and opens up pores. The most commonly used over-the-counter chemical peels for acne are AHAs and BHAs. AHAs are used on skin types that don’t form permanent brown coloration after they are irritated. BHAs are used on dark brown and black skin to prevent and remove black spots on the skin. At-home chemical peels are OK as often as every other day if you do not use scrubs or exfoliants. A chemical peel almost never gets rid of existing brown spots without the help of whitening agent, but you need to be sure to use the right whitening agent for your skin type. A complete acne treatment system like Exposed Skin Care will minimize your need for peels. Beauty experts have been using chemical peels to heal the skin for thousands of years, although the ancient beauties of legend probably did not realize that they were using acids to strip away dead cells from the epidermis of the skin. The famed Egyptian queen Cleopatra was known to bathe in tubs of milk. Milk contains lactic acid, which is even in the twenty-first century still used as a chemical peel for acne. The nineteenth century starlet Lily Langtry was said to bathe her face in apple cider vinegar to fight the effects of the sun on her long stage tours of the American West. Vinegar is a form of acetic acid, which is still used in homemade acne chemical peels. 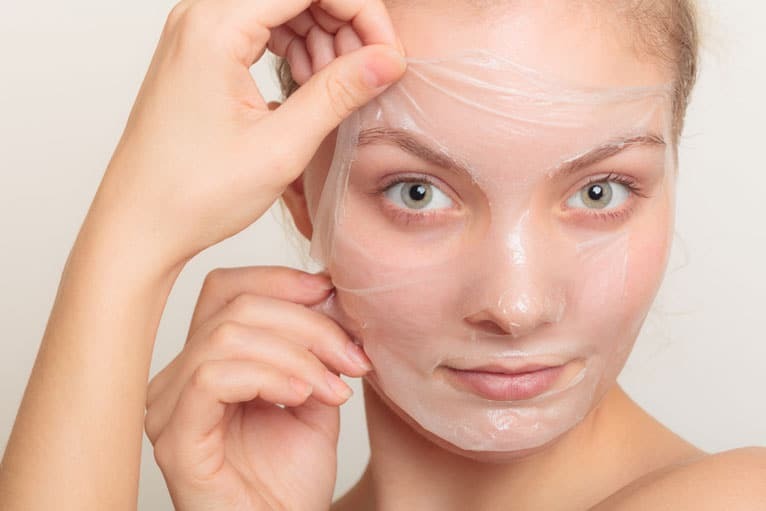 Chemical peels lift dead skin off the surface of the skin. This makes room for more skin cells to migrate upward to the surface of the skin from the basal layers below. These younger skin cells have more natural skin tones than the dead skin cells they replace. They are smaller, so the skin is not as tight. This gives pores more room to drain so they don’t clog with dead skin cells and sebum. And the act of using a chemical peel on the skin stimulates the production of collagen beneath the skin. This fills in pitted scars and makes the skin both strong and flexible. Every skin peel, however, does not work for every case of acne. Some products work well on some kinds of skin and don’t work at all on others. Alpha-hydroxy acids, also known as AHAs, loosen the “glue” between skin cells on the surface of the skin. All over-the-counter acne chemical peels are alpha-hydroxy acids except salicylic acid. Beta-hydroxy acids, also known as BHAs, also loosen dead skin cells on the surface of the skin, but they are generally milder than beta-hydroxy acids. Salicylic acid is the only beta-hydroxy acid used in skin care. One of the byproducts of sebum broken down by acne bacteria, propanoic acid, is also a beta-hydroxy acid. Omega-hydroxy acids, which are so seldom discussed that they don’t have a commonly used abbreviation, are the acids that break up the waxy surface of leaves and stems of plants. If you come across a skin care product advertising omega-hydroxy acids, don’t use it. These chemicals have no benefit for human skin. Glycolic acid is the most commonly used chemical peel for acne-prone skin. It is typically use to open the skin rather than to remove brown spots. It is more often used on dry and tight skin rather than on oily and loose skin. Glycolic acid is used at a relatively high strength, up to 10% in over-the-counter products, and up to 30% in products used under medical supervision. Lactic acid is the acid found in milk. It is especially useful for removing brown spots on tight, oily skin. It is a product you would use—with caution—on brown spots around the eyes. Salicyclic acid is used on dark skin. It is both a peel and an anti-inflammatory. Salicylic acid is used in much lower concentrations (never more than 3%) than glycolic acid. Chemical peels produce immediate color in the skin. It is tempting to use them every day. If you use retinol, Retin-A, tretinoin topical, or any skin care product labeled as containing either alpha-hydroxy acids or beta-hydroxy acids, however, you should use peels no more often than once a week. You should not use both a scrub and a peel. Pick one or the other. Using both products can leave skin red and irritated. If you do not use any other products to exfoliate or peel the skin, you can use a chemical peel as often as every other day as long as you do not experience redness or irritation. If you have dark brown or black skin, you should use a BHA product, not AHAs, and you should start with the lowest possible concentration to make sure you don’t irritate your skin. If salicylic acid causes irritation, you will need to rely on scrubs and skin lighteners. On the other hand, if your objective is to remove spots after acne, you need both a peel and a lightener. Hydroquinone usually is OK for fair skin, but it can be disastrous for Asian and African skin types, sometimes causing permanent black and blue discoloration of the skin. Arbutin, azelaic acid, kojic acid are safe for all skin types, but you should rotate products every time you finish a jar of the skin lightener. This keeps you from reinforcing any undesirable changes that make occur as an unexpected “quirk” of your skin. What’s Different About the Acne Chemical Peels You Can Get at the Doctor’s Office? If you get a chemical peel at the dermatologist’s office, you will probably be treated with a much stronger product. The AHAs you get in over-the-counter products are only strong enough to dissolve the “glue” that holds dead skin cells to your face. The AHAs you get at the doctor’s office have a pH so low that they send healthy skin cells into shock and they die. This does help remove excess layers of skin that may be keeping pores tight, but it also causes much more irritation to your skin. Used skillfully, however, AHAs may make the skin clear and plump. Dermatologists also do treatments with phenol and trichloroacetic acid to remove more layers of skin. These toxic skin peels may be mixed with croton oil or septisol to make them penetrate even deeper into the skin. These potentially dangerous skin peels have been largely replaced by laser resurfacing. The only time a chemical peel is likely to be used at the doctor’s office is when treatment of acne or acne scars with laser would leave a noticeable line on the skin.